Cool Virtual Worlds Article - Virtual Worlds Land! Rate this Article While you can find a virtual world that has the best houses, or the most people, it can be hard to find one that is cool, and a lot of fun to play. We have prepared a list of the games we felt are worth the time to play. Virtual world games are without a doubt some of the most immersive and addictive games out there because there’s so much to do in these games. In this article we’ll be covering some of the games that were really cool for us to play. and stood out to us from the rest of the pack. There are many things that define a cool virtual world, and the first of these is of course that the game should have a good variety of gameplay options for the player. Most games worth their salt are so packed with features that people can play for days on end and still not have fully experienced the entirety of the game. While most of the gameplay offered by these games tends to be executed in a realistic manner, some let you do crazy things like flying which makes the experience all the more enjoyable. Alongside all this you’ll also see that these games allow you to construct houses of your own, even luxury mansions. Not to mention that you can also live the millionaire lifestyle with private jets and huge wardrobes of designer clothes. Other than just having great gameplay features, the key thing about the games in this genre is interaction with other players and a game can’t really stand out unless it offers great social features. The best virtual games let you make friends, invite people over to your house for parties, play mini-games, ride together on horses and a whole lot of other stuff for a really exciting experience. Each of these games was one that had something special, that makes it rise above others and they are all just fun to play, but also are pretty cool too. Second Life is pretty much the very first game that comes to mind when discussing this genre and rightly so as this game has been around for quite some time and over the years it has constantly impressed its player-base with amazing gameplay features, top notch design, breathtaking environments combined with some of the best social features out there. There is also a massive community that play here, and you can easily make friends and find fun people to hang out with. 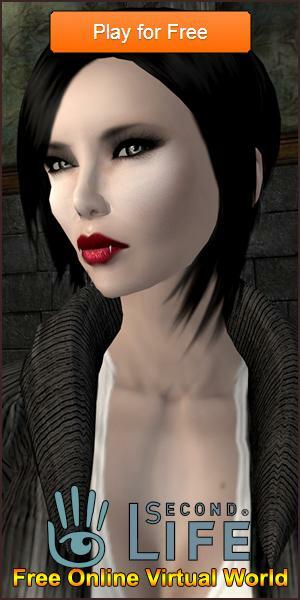 IMVU is a hugely popular virtual world that takes things to a whole new level. Aside from executing all the other genre defining features with absolute perfection, the game also allows players to actually build up their own social islands from scratch and if there is demand for them they can even sell houses, clubs or even cars that they made for the in-game currency. Alongside all this, players can even get married and have children of their own if they want. On Fascebook you have YoVille, and it starts off with a bang. As soon as players get into the game they’re given their very own house to customize however they please. Players can get a job for extra money, make friends, play mini-games with others or just stroll around town in this addictive game. Virtual Highway is perhaps one of the most pure virtual world game out there. While it doesn’t emphasize on providing players with things like flying and such, it focuses heavily on re creating reality within the game and does an excellent job of it. There is just so much to do in the game such as setting up your own shop, joining communities and of course spending time being cool with your friends. Any of these cool virtual games will give you a great experience, and each has something unique to offer you when you play. One of the great things about these games is that the more you put in the more you can get out of the game, and we hope you get everything you want and more.